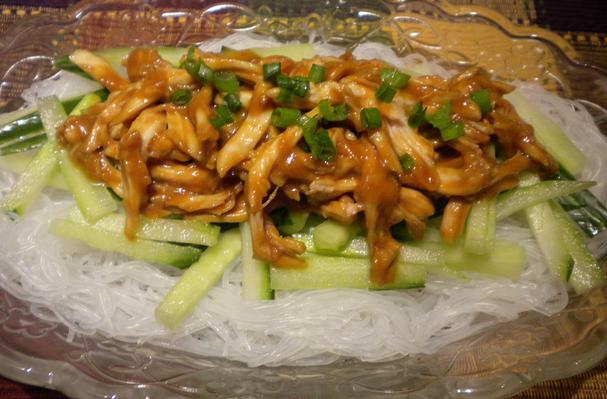 Cellophane Noodles are a thin, transparent type of Asian noodle usually made from mung bean flour. These noodles are very hard and opaque when dry but become soft and transparent when cooked. Cellophane Noodles can be used in stir fries, soups and hot pots. They must first be soaked in hot water for a few minutes before cooking in dishes other than soup. Long strings or strips that look whitish, but turn clear after boiling. They are available in a variety of thicknesses, but are most often very thin. Choosing: They can be very brittle when dry, and break if handled roughly. If their covering isn't transparent, you can make sure the noodles are mostly whole by carefully turning the package over in your hands, the way you might a box of cookies. Buying: In the grocery, they're usually sold dried, in packages that can be labeled 'fensi,' 'mung bean.' 'bean thread,' 'cellophane,' 'glass,' or 'transparent' noodles. They can also be purchased in unwrapped bundles. The unwrapped bundles are more likely to be found at markets specializing in Asian foods than in supermarkets. Procuring: This is a processed food, usually made of mung bean starch mixed with water into a dough which is then extruded into string or flat noodle forms, and dried. Besides soups, they're also a popular ingredient in spring rolls and stir fries, and are sometimes used in vegetarian dishes as a replacement for shark fins. Cellophane noodles take very little time to cook, so they are usually soaked in hot or boiling water until they are just tender enough to use, and then added to the recipe at the last minute, so they won't become so soft they fall apart. Dried, they can be stored almost indefinitely. History: They were developed in Asia and are a staple of many cuisines in the region. I have been looking for a recipe for what is pictured here. I'd love to make it. Let me know if someone has a recipe.